Craps is the third most popular casino game in the world (just behind slots and just ahead of roulette). 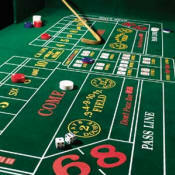 Craps is a dice game played on a special felt table, and is unique because only one person shoots the dice, but up to twenty players can bet on the outcome of the shooter's rolls. To play craps you place your wagers on the felt table, and wait for the outcome of the roll. Sometimes you will win, sometimes you will lose, and sometimes nothing will happen and the shooter will roll again. The rest of this article will teach you how to play craps, and explain the most popular craps bets. A game of craps begins with a roll of the dice. This initial roll is called the "come out" roll. If the shooter hits a two, three, or twelve, then all pass line bets lose and the shooter throws another come out roll. If the shooter hits a seven or eleven, all pass line bets win and the shooter throws another come out roll. If the shooter hits any other number, that number becomes the "point". They hit the "point" - causing all pass line bets to win. They roll a seven - causing all pass line bets to lose. Once they either hit the point or seven out, they then pass the dice to player on their left, and the process repeats. In craps there is one main bet that players make, and that is the pass line bet. You can bet on the pass line by putting your chips in the section of the table named "pass line". As I mentioned before, if the come out roll is a two, three, or twelve, you lose your money. If the come out roll is a seven or eleven, you win. If a point is established, and the shooter this the point before sevening out, you win. The pass line bet pays 1:1. This is one of the only bets in the casino that has no house edge. Therefore, you should always take the odds when possible, because it reduces the house edge on your pass line bet. The don't pass line bet is the exact opposite of the pass line. If the come out roll is a two, three, or twelve, you win. If the come out is a seven or eleven, you lose. If a point is established, and the shooter sevens out before they hit the point, you win. The don't pass line pays out 1:1. Just like taking the odds, laying the odds is an even money bet. There is no house edge at all on this bet, so we always recommend laying the odds after betting the don't pass line. The come bet is exactly like the pass line bet, but it is made after the come out roll. You place your wager, and the next roll acts as your own come out roll. If the come out roll is a seven, you win. If the come out roll is any other number, that number is your point. Once your point is established, you wait to see if the shooter rolls your point again or sevens out. Even if they hit their own point, your bet stays on the table until someone either sevens out or hits your point. The come bet pays 1:1. The don't come bet is the exact opposite of the come bet. It is placed after the original come out roll, and if the first roll after you make your don't come bet is a seven, you lose. However, if the roll is any other number, that number becomes your point. Then, you hope that the shooter sevens out before hitting your point. If they hit their own point, your bet stays on the table until someone either sevens out or hits your point. If they seven out, you win a 1:1 payout. If they hit your point, you lose. Find a full list of craps bets at Craps-Casinos.com. Play free craps online at FreeOnlineCraps.org. Learn how to play craps online at onlinecraps.net.